Speaking at the press conference, Mr Furbert said: “The Minister of Finance, the Hon. E. T. Richards said in his press statement on Friday January 27, 2017 –’The Government will continue to be transparent and collaborative because this transaction is in the best interests of all Bermuda’. “This statement is completely false because the Minister has not been transparent in the way he has handled this Airport Deal from the outset. “The only reason why the Minister has decided to be a bit transparent is only because of the challenges from the People’s Campaign, the PLP, M.O.V.E, and the Protest that took place on December 2, 2016 over this Airport Deal. “The Minister went on to state “contrary to assertions from some quarters, Parliamentarians will not be voting for or against the project, or the Project Agreement, through the bills that are before the legislature. “Was this statement questioned by any members of the media? “Press Statement by the Premier the Hon. Michael Dunkley: ‘So I take my hat off to finance Minister Bob Richards for coming up with a deal with the Government of Canada that gets the airport terminal built without adding to our national debt‘. “Let me just remind Bermuda what the then Shadow Minister of Finance E. T. Richards, in his reply to the 2009 Budget statement, said. “There seems to be much discussion of public private partnerships [PPP]. The Government is planning to rebuild the KEMH and the Causeway using PPPs. “The first thing that Honourable members and the public should know about PPPs is that they are a form of off-balance sheet financing, that is a PPP enables all or part of the debt to finance a project to not appear as part of the government’s debt. So it is a way for some governments to off -load public debt to private entities. “But, Mr. Speaker, there is no such thing as a free lunch. The private partner will not likely have as high a credit rating as the Bermuda Government, therefore the financing is bound to be more expensive than if Government borrowed the money itself. “Today, with the credit markets demanding huge extra interest for incremental risk, this extra finance cost will be very significant. Even if the private partner were highly rated, that entity would not be renting their balance sheet to Bermuda for free. So PPPs generally add extra cost. “The Bermuda Government plans to guarantee the debt of its PPPs. This would have the debt be viewed as on-balance sheet financing and therefore become part of the national debt, an approach that defeats one of the principal rationales for a PPP. “Perhaps this model of PPP is an admission by Government that it is so terrible at managing large project s that it may be less expensive to pay a foreign entity hefty management fees rather than taking the operational risk of doing the job itself. “On November 21, 2014 the Minister of Finance advised the House of Assembly that the Bermuda Government entered into a Memorandum of Understanding with the Canadian Commercial Corporation to pave the way for the re-development of a new airport using a Private Public Partnership [PPP] model”: The Minister of Finance has now adopted the same approach that he objected to in 2009. “On Sunday January 29, 2017 the Minister of Finance the Hon. Bob Richards said on the Shirley Dill radio talk show that “the train left the station”. Why would he say that? a. Did the Minister ask the UK Government to finance this Airport Deal? If not, why not? b. Did the Minister approach the Banks in Bermuda? If not, why not? c. Did the Minister approach International Business? If not, why not? d. Did the Minister consider posting a bond to raise the money? If not, why not? “If the Minister did not pursue at least these four options then the Minister did not carefully consider all the options. “The People’s Campaign Manifesto: The Government does not own public property but holds it in trust on behalf of the people and therefore should exercise proper stewardship that protects the assets of the people against privatization”. Well, I can probably respond to the 4 options he lists. 1) I suppose we could have asked the UK government to pay for the airport but I have no idea why Furbert should think the UK Department of International Development would do that, like they did the St Helena airport. The UK built that airport because the only way to get there were ships from South Africa. St Helena is in a different dependency category than we are. We have a higher per capita GDP than the U.K., so I think unlikely they would offer to pay for it. 2) Approaching the local banks would imply that the Govt would be the borrower. That defeats the purpose of not adding to our debt. 3) Um, does he think Int’l Business would just pay for our airport? Not sure I follow his logic. I believe there will be some equity investors from the IB sector in the project co, so I guess that dialogue did happen. 4) Again, not sure I follow his logic. Posting a bond to raise financing? Does he mean offer a Guarantee? That would make it on balance sheet for us. I think in an ideal world, we would raise the funds and pay for the airport ourselves. But we don’t have the capacity to service the additional debt so we can’t. These questions demonstrate that the Hon. Premier Furbert has no idea on how these things work. Mr. Furbert. You allowed the people of Bermuda to believe the untruths about Mr. Tweeds contract. Your intentional omissions prevented the people of Bermuda from knowing the truth and many believed you. Then we learned the truth. You do not have any right to preach to others on how business should be done! What experience do you have. What great financial decisions have you made on behalf of the Unions members? Was it the Berkely deal? Had the PLP not forgiven that debt the union would be gone! The CO-OP supermarket? Taxi CO-OP? Tell Us. The membership or YOU have no idea how the union is doing financially. The Unions financials have not been audited and presented in how many years? At one point the Union was 11 years behind. Mr. Furberyt make a decision. If you are going to be the union leader, then F’n lead! If you want to be a politician , then resign your position at the BIU and become a politician. The unions affair are not in order, the membership when asked to down tools to support your own agenda, is given ZERO DOLLARS. Pick a job, any job and concentrate on that job so it is done well. More people might respect you then. Being a leader isn’t like playing Teaxs Hold’em? You can’t have a bad night and bluff your way through it. Eventually someone will call you on it and raise you All-In . And then what? Some of you will understand what I really mean. Of course Premier Furbert understands how things work. Move over Mr. Buffet… who could deny the brilliance of that there? ct answered all this above. Posting a bond = the same as borrowing the money. It is exactly the same thing. The usual PLP way of doing things is: Get quotes for the job, pick the one involving your friends, borrow the money from overseas bankers, wait for the actual price of the job to triple or quadruple, then borrow more money from overseas bankers. A couple of those questions were answered by Bob on the Shirley Dill radio 2 hour interview. I suggest the biu members find the recording on Facebook and listen to it all. That is if they want the answers. THEY CAN”T HANDLE THE THRUTH. You haven’t had enough licks lately ? Furbert’s questions show absolutely no understanding of how capital markets work. Does he really think the local banks want anything to do with this airport? Why in the world should IB pay for anything in the new airport? What does he even mean by posting a bond? I think he heard that phrase on tv and is trying to use it to sound like he knows what he’s talking about. Bottom line, this is the best way to fund the airport and it will create jobs for the workers who pay your salary Furbert. You should just stay quiet and enjoy the gravy train you’re riding for another couple years. Furbert does raise valid points. Why weren’t these options considered? Since when did the UK go around funding its territories’ capital projects? And after Erat dissed them with his Uigher stunt, any such request would get laughed at. Local banks are not going to lend that kind of money for a local project – concentration of risk would be off the charts for them. You would have a lot of nerve to ask IB for any money for a capital project after all they do for our island. And if by “posting a bond”, he means go out and borrow in the capital markets… well, that’s just plain stupid. That well is dry. Firstly, when Furby actually produces updated union financials ( ten years and still waiting?? ) and blurt finally explains where we can find our $800 MILLION that disappeared under his watch as junior finance minister and as an added bonus explain why we the TAX had to pay for MANY hundreds of $MILLIONS of mysterious cost over runs on EVERY infrastructure project his plp was involved with?? Then and only then should they even be asked their opinions on anything concerning OUR finances!! They were. This has largely been answered many times. I don’t understand what part of the airport issue is a matter for a labour union. Does it not create unionized jobs? Does it not provide improved work conditions for unionized airport workers? Surely its not just political interference? UM What happened to we will now have press conference with our supporters behind us?? Guess they didn`t show up,,AGAIN!! Chris Furbert please step down! And by the way, the OBA does have a mandate from the “PEOPLE” WHO ELECTED THEM to do so with the airport ! I think Chris Furbert, the BIU, The PLP and the Peoples campaign should finance the airport deal!! He never ceases to amaze me and not in a good way! What a joke he is! OBA, former UBP, and it’s supporters will run the PLP into the ground because of overruns but will not step up to the plate, COWARDLY behaviour. The Deal is Not Good, PERIOD!!! I call on the children of OBA members to Stand Up!!! @jusakin you need to get your head out of the sand! They cant say we don’t need one because the PLP themselves explored a plan to build an airport about 10 years ago? Can you really say its too big or too expensive because it cost less that the PLP plan? What is the PLPs plan? To borrow 2X the cost of this airport plan and risk going into cost overruns? Your interest and loan payments would be greater than any projected income even without cost over runs. Do you not think there will be any maintenance to do? You goinga borrow that money too? look, I’m all in for looking at other plans and options. But if you DON’T have one please don’t complain! Here is a plan, I call it “My Family Model” based on a time when banks were not lending to a certain sector of the community. Members of “My Family” bought their materials a bit at a time and constructed a bit at a time. It was slow yet sustainable and left them with ZERO debt. Some were wiser than others and added apartments. That led to instant returns on their investments. Are we getting an airport we desire or one that was suggested? At least he is trying to offer some solutions–and that is a very positive first step as it means he has thought through options–now when the reality of why those options won’t work are presented he will be able to process those and perhaps then he will understand the “rock and the hard place” Bermuda finds itself in and then articulate it to his cohorts. One comment on IB–they do so very much for this country and get disrespected at every turn, why would we even think they wwould want to donate to an infrastructure project which is the reponsibility of the people and government of the counntry. I am encouraged that Mr. Furbet is thinking trhough the issues and not simply reacting. The train has left the station! – this is a Westminster form of government, the only thing democratic about it is the vote. Beyond the vote, it is a dictatorship. Really?! This isn’t at all within the framework of intent of the relationship – he is clearly a confused person. Borrow more..? Remind me how much we pay from the incompetent PLP methods that exhausted debt as an option? Has he ever heard of a credit rating or is he clueless? CF – do us all a favor, go get an education & step down while you are out achieving this please. Where’s the strike fund you should have saved for your members? is your own house in order? That aside, while the terms of the deal may not be optimal, its the only method we have clearly given the financial position the PLP kindly left us in. He should be ashamed of himself if he is actually aware of how wrong he is. This is fake news, misguiding of people and spreading ignorance on the topic. When will members get to see the BIU financials? Sooo, what is the bill for? Can they start the airport without passing if legislation? On Google google the ocean marine traffic. I see MHS Mohawk out there and another numbered vessel. Somebody must of slip and bump their head this morning. Mind you I dont want no trouble. This has Zero to do with the Unions. Can someone please just tell me how the airport redevelpment project falls into the remit of BIU? I am at a loss on this. 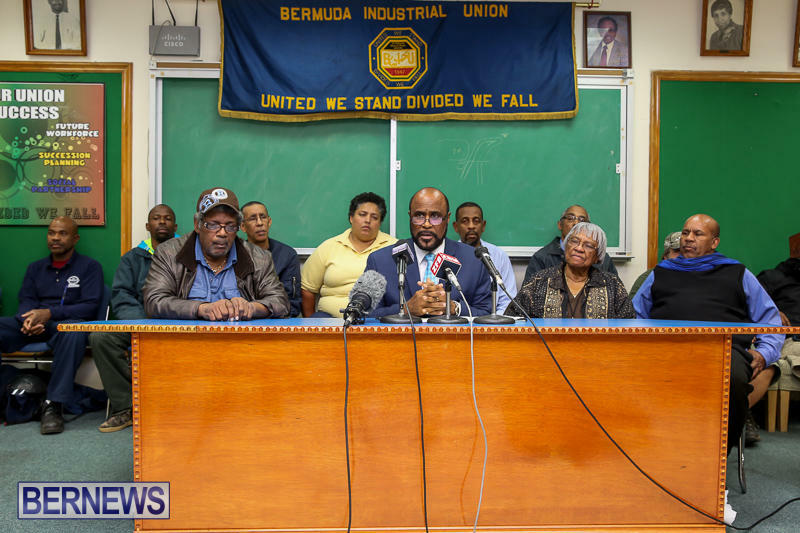 Bermudians already being hired, local construction companies getting to work (Bermudian jobs), the plans speak to bigger and better than what exist (more Bermudian jobs to run it). Just Politics for the sake of it? By the way, what happened to the blue ribbon panel report??? Supposed to be done by the end of January.. @lifetime!! Always hiding behind a camera????? That is the most stupid comment and post ever!! Ready yourself dreamer for disappointment!! LOL, I can’t belive you actually believe that! Then again “you had to be deceived” or did you conveniently forget. Name ONE thing in Bermuda that was better AFTER the PLP left than it was before they came into power. And then ask yourself, of these same (or other areas) is Bermua in this same areas in the three years since they took over? Let me help you with a few that come to mind but feel free to add to it. Government Contracts that went over budget? I await your reply! but something tells me you will just pretend you didn’t see this. For International businesses who depend on credit ratings to do business (and who keep this island alive financially) their credit rating can be no higher than the country they operate in. If Bermuda borrows more our credit rating goes down, theirs goes down and guess what, they move to another country with a higher rating. Come on fur Bert you are messing with the future or the island and jobs for the people. How about those interns going to those various jobs to get train you against that also. Why is the BIU involved in the airport project ? if the airport project was under the PLP leadership them it would be 1,000 percent OK, they cant stand the OBA no matter what they do why dont the PLP go out and forms jobs for people instead of ALWAYS putting down the OBA remember people the PLP put BERMUDA and its PEOPLE in MAJOR DEBIT the OBA was left at the bottom of the well to get BERMUDA and its PEOPLE to where we are today, and BURT I wish you would find another word then DEMAND REALLY???? You DEMAND ???? it is EATING AWAY AT THE PLP that the OBA is in LEADERSHIP it shows every time they open up their MOUTHS and its FULL OF HATRED. Mr Furburt. Please for the sake of mankind simply keep your mouth closed. Let the brain TRY to catch unto your tongue if possible. BUILD IT NOW WE DONT NEED YOUR PERMISSION NOR THE PLP Please just go crawl under a rock. You are daft enough to cut your nose to spite your own 2 face. You will MAKE money should any of the workers join your band of hypocrites. NO I haven’t even bothered to read or listen to the article. I am a BERMUDIAN with red blood and not overly political for either party but I am not stupid we need it and this is the cheapest best way since your co hurts left the island BROKE!!!!!!!!!!!!!!!!! Mr FURBERT and your followers, why not chase where all the over runs from the plp projects went. That will pay for airport causeway heck couple burgers also. What deal did we ever see under the PLP nothing just the end results. Look at the hospital did not do that right either no more beds. Furbert please find something else to do. Maybe you could help build the airport since you know so much. And remind me again what this has got to do with the union?.. oh that’s right brother Chris just geeing up his crowd even though it has nothing to do with labor issues. Was bad when the PLP wanted to do it but now its a novel way of doing business. It was 2X the cost and no plan on how the PLP would pay for it …you know after they kinda spent our money and STILL overspent by over a billion, and lets not forget the nagging little detail that $800M was unaccounted for during their time in office. To break it down for you that means they “lost” or “can’t find” where the equivalent of $156,555.00 went every single day they wee in power for those last 14 years. Don’t trust what I say, look it up, ask you PLP members what happened? Report back. I will wait right here. To me it doesn’t appear that the people Mr. Furbert has surrounded himself with seem very interested. Perhaps they would be more interested if he was explaining the B.I.U.’s financials to them but he isn’t is he. Those people need to ask that of Mr. Furbert after all he is a labor leader not an MP right? If Mr. Furbert wants to make demands from Government and use big words like transparency he should get his own house in order first. I think. I just wonder if those that consistently sit behind Chris Furbert ever feel embarrassed? Do they just blindly follow this man? Do they ever consider we are in 2017 not 1956! I would NEVER entrust my hard earned money to the BIU and am ever to grateful today my donation goes to a worthy charity. In this life we need to support groups that are actually helping those in need. Donate your Union dues to charity. The Unions have lost their way under Chris Furbert and Jason Hayward.